Can Prescription Drug Monitoring Programs Aid Perioperative Clinicians in Reducing Opioid-Induced Ventilatory Impairment? As Dr. Takazawa et al. point out through their reported experience in Japan, the actual risk of sugammadex-induced anaphylaxis is very difficult to determine given the information to date. The authors report an incidence ranging from 0.0025% to 0.039%. This is a 15-fold difference depending on the use of data from the Japanese FDA equivalent or reporting from a single center study. As the authors suggest, much of this variability stems from difficulty in recognition, confirmation, and perhaps most importantly voluntary reporting. This voluntary reporting (numerator) that we also have in the United States makes it difficult to accurately estimate the incidence (the reported cases of anaphylaxis/total number of dose-exposed patients). So what do we know? The package insert from Merck and Co. describes an eyebrow-raising incidence of 0.3% hypersensitivity reactions in healthy study volunteers.3 This is many-fold higher than the incidences described by Takazawa et al., and similarly far exceeds our own anecdotal two-year clinical experience. Ultimately, anaphylaxis is a binary event for the patient and the provider—either it happens or it doesn’t. Should significant anaphylaxis to sugammadex occur, the first-line treatment is small boluses of epinephrine titrated to response, followed by an epinephrine infusion when needed.7 As an example, a case from our institution, which was reported to MedWatch, involved an elderly man with previous anaphylaxis to a non-steroidal anti-inflammatory drug. Rocuronium was reversed at the end of the case with 2 mg/kg sugammadex. One minute later, the patient’s blood pressure dropped to a systolic blood pressure in the 40s with accompanied desaturation, skin flushing, and severe bronchospasm. The patient was treated with intravenous epinephrine (three 20-mcg boluses), diphenhydramine (50 mg), dexamethasone (12 mg) and famotidine (20 mg). The patient’s symptoms subsided over 10 minutes, and he was briefly administered a low-dose epinephrine infusion. His tryptase level after the event came back significantly elevated at 74 ng/mL.8 This was the first sugammadex anaphylaxis event in our institution after approximately 4,500 patients had been administered the drug. A second case approximately one year later presented as isolated bronchospasm without cardiovascular collapse and was resolved with two 20-mcg epinephrine boluses. 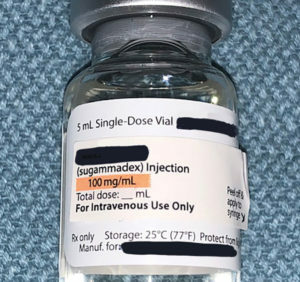 It is encouraging that case reports and personal experience confirm that when sugammadex anaphylaxis occurs, it responds to the usual therapy and that our anecdotal local incidence is < 1:4,000, i.e., < 0.025%. In summary, anaphylaxis to sugammadex is a potentially high-consequence event that most assuredly happens as described by Takazawa et al. at some unclear but low frequency. It may occur without prior intravenous exposure. Importantly, anaphylaxis appears more likely at higher sugammadex doses, occurs at the end of case (within five minutes of exposure), and responds to standard epinephrine-based anaphylaxis treatment. Dr. Corda is an Assistant Professor of Anesthesiology and Chief of Multispecialty Anesthesia at the University of Florida. Dr. Gravenstein is The Jerome H. Modell Professor of Anesthesiology, Professor of Neurosurgery, and Professor of Periodontology at the University of Florida. Neither author has any disclosures as they pertain to the present article. Takazawa T, Katsuyuki M, Sawa T, et al. The current status of sugammadex usage and the occurrence of sugammadex-induced anaphylaxis in Japan. APSF Newsletter 2018;33:1.
https://www.accessdata.fda.gov/drugsatfda_docs/nda/2015/022225Orig1s000SumR.pdf. Accessed March 2018 . Bridion® Prescribing Information: Accessed on March 29, 2018. https://www.merckconnect.com/bridion/dosing.html?gclid=CjwKCAjwwPfVBRBiEiwAdkM0HRmYcD7oNbtdcOS7t1oDoUuYjy4YMCBaNzrdE3x3zTCLAboW4mMMwxoCF5cQAvD_BwE&gclsrc=aw.ds. Accessed March 2018 . Mertes PM, Malinowsky JM, Jouffroy L, et al. Reducing the risk of anaphylaxis during anesthesia: 2011 updated guidelines for clinical practice. Journal of Investigational Allergy and Clinical Immunology 2011;21:442. Tsur A., Kalansky A. Hypersensitivity associated with sugammadex administration: a systematic review. Anaesthesia 2014;69:1251–1257. Brull SJ, Kopman AF. Current status of neuromuscular reversal and monitoring challenges and opportunities. Anesthesiology 2017;126:173–190. McEvoy MD, Thies KC, Einav S, et al. Cardiac arrest in the operating room: part 2—special situations in the perioperative period. Anesthesia & Analgesia 2018; 126:889–903.